Leather vs. Fabric Sofa: Which Couch is Best? People often think the choice between buying a fabric couch or a leather couch comes down to cost, but there are many other factors to consider. While it's true that leather sofas generally do cost more, there are other pros and cons beyond mere price. Fabric sofas are often unfairly maligned as cheap and undependable when the truth is far more complicated. 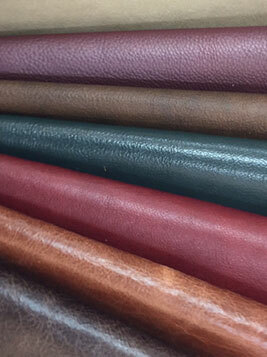 There are different kinds of fabrics that wear differently, just as there are different grades of leather. When contemplating a leather vs. fabric couch, it is best to leave your preconceptions at the door. 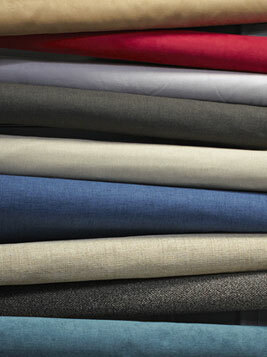 The consensus is that fabric wins easily when it comes to comfort. It's softer, more pliable, and less temperature-respondent to room conditions. Leather, on the other hand, can turn sticky and sweaty in hot weather or provide a chilling jolt when it's cold. 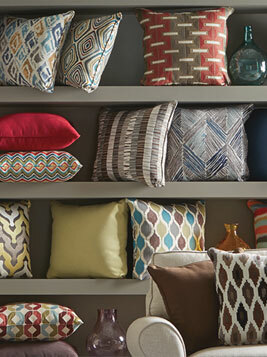 However, some cheaper fabrics will pull and stretch over time or become loose and create bunching on cushions. Higher grades of leather can feel buttery soft to the touch. The question to ask is, which would you rather take a nap on? Fabric couches offer infinitely more choices than leather, with a dizzying array of patterns, colors, shapes, and upholstery techniques. On the other hand, nothing matches a high-quality leather couch for making a sophisticated impact on a room. Once again, it comes down to personal choice. Do you want your sofa to be the main design element in your living room, or do you want pillows and side chairs to perform that function? If you're okay with the couch being neutral, you can opt for leather and augment with additional patterned pieces. When it comes to food spills and daily wear and tear, leather couches are the champs. Even the nastiest spills wipe right up, and, as animal hide is meant to withstand the natural elements, it's up to any challenge most families can throw at it. However, a leather sofa will require regular maintenance to keep it supple and prevent cracking. As for fabric couches, most are treated with stain resistors, but there is always the risk of an especially tough red wine, ink or tomato sauce stain becoming permanent. Higher-quality fabrics will also be longer-lasting. Ask about the rub rate of the piece you are considering, which is a test given to fabric sofas to check durability. You will want a piece with a rub rate over 25,000. It is an often overlooked fact that leather couches are hypoallergenic. If you share your home with someone who has an environmental allergy, this can be invaluable. Leather sofas won't trap dust mites, pet dander, and other allergens as easily as fabric couches, which are like sponges for the offending matter. Plus they are much easier to clean, which also pays dividends in the allergy department. It is possible to keep a fabric sofa free of allergens, but, in the long run, it will be costlier, more time consuming, and take more effort than it will with a leather couch. By and large, it is true that leather couches are more expensive than fabric couches. However, there are some luxurious fabrics on couches made by name designers that will rival or exceed the cost of any leather couch. There also is lower-grade leather that can seem like a bargain, as long as you're not expecting the durability of a higher grade. Comparing apples to apples in the debate of the leather vs. fabric sofas, two couches in the same style, made with the same quality frame, will always cost more in leather, but is likely to last longer.